And that's really all you need to know about how incredibly fucked up our gun laws are in this country. Because they are. What do they have those weapons for? What are they hoping this will teach people? Have they considered the actual implications of normalising walking around with prominent deadly weapons? In the gun-cuddling utopia they envision, it's even easier for someone with malicious intent to get into a position to cause actual harm. "How could we possibly have guessed that he was on his way to [insert tragedy here], officer? He was just walking down the street with half a dozen firearms strapped visibly all over his body, not concealing them like a villain!" And presumably the officer can then report that the suspect was not displaying a Registered Mental Illness Armband, and thus truly no one could have seen this coming. 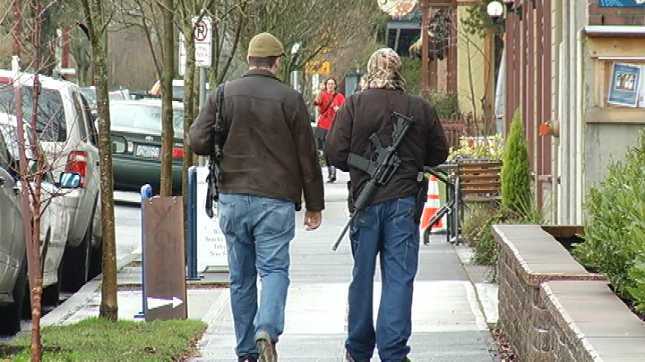 Being armed in public is suspicious. If someone shows up at my birthday party with a chainsaw, I am going to be unsettled, no matter how benevolent they look, because: who the hell brings a chainsaw to a birthday party? It's not the guns that make these guys scary. These guys think in ways that would be scary in any context. The guns are just a visual aid to what's going on in there.